Speak the truth, and all nature and all spirits help you with unexpected furtherance. God will not have his work made manifest by cowards. Always, always, always, always, always do what you are afraid to do. Do the thing you fear and the death of fear is certain. We walk alone in the world. Friends, such as we desire, are dreams and fables. Better to know a few things which are good and necessary than many things which are useless and mediocre. 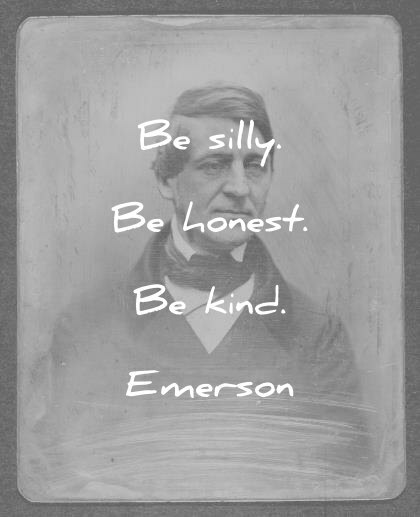 One liners, short Emerson quotes, thoughts and captions for your bio, social status, self-talk, motto, mantra, signs, posters, wallpapers, backgrounds, tattoos, SMS, Facebook, WhatsApp, Snapchat, Tumblr, Twitter, Pinterest, Instagram, etc. The one prudence in life is concentration. There is something which you can do better than another. Listen to the inward voice and bravely obey that. Do the things at which you are great, not what you were never made for. 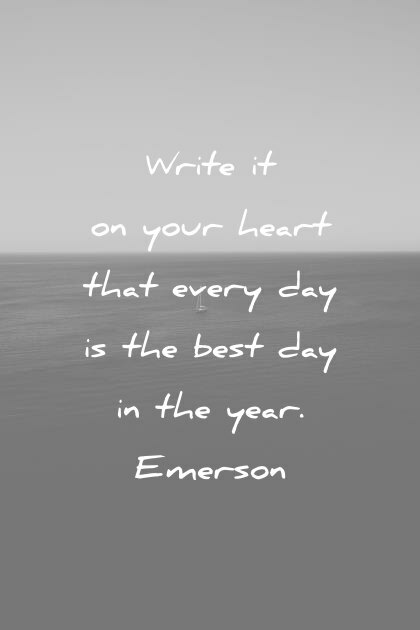 Finish each day and be done with it. You have done what you could. Some blunders and absurdities, no doubt crept in. Forget them as soon as you can, tomorrow is a new day; begin it well and serenely, with too high a spirit to be cumbered with your old nonsense. No facts are to me sacred; none are profane; I simply experiment, an endless seeker with no past at my back. The one thing which we seek with insatiable desire is to forget ourselves, to be surprised out of our propriety, to lose our sempiternal memory and to do something without knowing how or why; in short to draw a new circle. The way of life is wonderful. It is by abandonment. The great moments of history are the facilities of performance through the strength of ideas, as the works of genius and religion. Enthusiasm is one of the most powerful engines of success. When you do a thing, do it with all your might. Put your whole soul into it. Stamp it with your own personality. Be active, be energetic, be enthusiastic and faithful, and you will accomplish your object. ‘Tis not important how the hero does this or that, but what he is. It will never make any difference to a hero what the laws are. His greatness will shine and accomplish itself unto the end, whether they second him or not. The reality is more excellent than the report. I chide society, I embrace solitude, and yet I am not so ungrateful as not to see the wise, the lovely and the noble-minded, as from time to time they pass my gate. Masses are rude, lame, unmade, pernicious in their demands and influence, and need not to be flattered, but to be schooled. I wish not to concede anything to them, but to tame, drill, divide, and break them up, and draw individuals out of them. Go put your creed into the deed, nor speak with double tongue. Conversation is a game of circles. In conversation we pluck up the termini which bound the common of silence on every side. Public opinion, I am sorry to say, will bear a great deal of nonsense. There is scarcely any absurdity so gross, whether in religion, politics, science or manners, which it will not bear. No matter how you seem to fatten on a crime, there can never be good for the bee which is bad for the hive. An original sentence, a step forward, is worth more than all the censures. For every thing you have missed, you have gained something else; and for everything you gain, you lose something else. For every grain of wit there is a grain of folly. A man is relieved and gay when he has put his heart into his work and done his best; but what he has said or done otherwise, shall give him no peace. All the good of nature is the soul’s, and may be had, if paid for in nature’s lawful coin, that is, by labor which the heart and the head allow. I no longer wish to meet a good I do not earn, for example, to find a pot of buried gold, knowing that it brings with it new burdens. I do not wish more external goods, — neither possessions, nor honors, nor powers, nor persons. The gain is apparent; the tax is certain. Explore, and explore, and explore. Be neither chided nor flattered out of your position of perpetual inquiry. Neither dogmatise yourself, nor accept another’s dogmatism. Why should you renounce your right to traverse the star-lit deserts of truth, for the premature comforts of an acre, house, and barn? Truth also has its roof, and bed, and board. Make yourself necessary to the world, and mankind will give you bread, and if not store of it, yet such as shall not take away your property in all men’s possessions, in all men’s affections, in art, in nature, and in hope. He cannot be happy and strong until he too lives with nature in the present, above time. ‘Tis curious that we only believe as deeply as we live. The least defect of self-possession vitiates, in my judgment, the entire relation. There can never be deep peace between two spirits, never mutual respect until, in their dialogue, each stands for the whole world. If you are true, but not in the same truth with me, cleave to your companions; I will seek my own. I do this not selfishly, but humbly and truly. It is alike your interest, and mine, and all men’s, however long we have dwelt in lies, to live in truth. Don’t choose the better person, choose the person who makes a better you. The charming landscape which I saw this morning is indubitably made up of some 20 or 30 farms. Miller owns this field, Locke that, and Manning the woodland beyond. But none of them owns the landscape. There is a property in the horizon which no man has but he whose eye can integrate all the parts, that is, the poet. Everything in nature contains all the power of nature. Everything is made of one hidden stuff. If a man has good corn or wood, or boards, or pigs to sell, or can make better chairs or knives, crucibles or church organs, than anybody else, you will find a broad hard-beaten road to his house, though it be in the woods. If the stars should appear one night in a thousand years, how would men believe and adore, and preserve for many generations the remembrance of the city of God which had been shown. Nature never became a toy to a wise spirit. The flowers, the animals, the mountains, reflected the wisdom of his best hour, as much as they had delighted the simplicity of his childhood. Nature hates monopolies and exceptions. There are many beauties; as, of general nature, of the human face and form, of manners, of brain, or method, moral beauty, or beauty of the soul. The moral sense reappears today with the same morning newness that has been from of old the fountain of beauty and strength. On stars: Every night come out these envoys of beauty, and light the universe with their admonishing smile. We ascribe beauty to that which is simple; which has no superfluous parts; which exactly answers its end. […] It is the most enduring quality, and the most ascending quality. Beauty rests on necessities. The line of beauty is the result of perfect economy. We wish to be self-sustained. We do not quite forgive a giver. The hand that feeds us is in some danger of being bitten. I have been writing and speaking what were once called novelties, for twenty five or thirty years, & have not now one disciple. Why? Not that what I said was not true; not that it has not found intelligent receivers but because it did not go from any wish in me to bring men to me, but to themselves. Trust the instinct to the end, though you can render no reason. It is vain to hurry it. 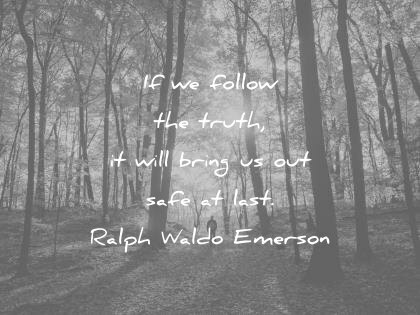 By trusting it to the end it shall ripen into truth, and you shall know why you believe. Accept the place the divine providence has found for you, the society of your contemporaries, the connection of events. Great men have always done so. I will so trust that what is deep is holy, that I will do strongly before the sun and moon whatever only rejoices me, and the heart appoints. On Henry David Thoreau: He chose to be rich by making his wants few, and supplying them himself. Self-trust is the essence of heroism. […] It speaks the truth, and it is just, generous, hospitable, temperate, scornful of petty calculations, and scornful of being scorned. Don’t waste life in doubts and fears; spend yourself on the work before you, well assured that the right performance of this hour’s duties will be the best preparation for the hours and ages that will follow it. 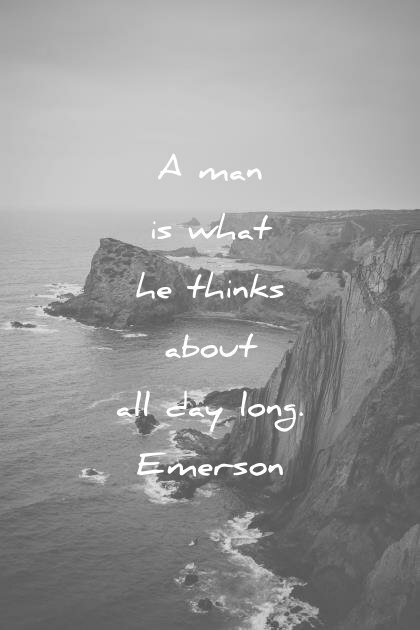 What a man does, that he has. What has he to do with hope or fear? In himself is his might. Let him regard no good as solid but that which is in his nature, and which must grow out of him as long as he exists. The goods of fortune may come and go like summer leaves; let him scatter them on every wind as the momentary signs of his infinite productiveness. The wise man throws himself on the side of his assailants. It is more his interest than it is theirs to find his weak point. Action is with the scholar subordinate, but it is essential. Without it, he is not yet man. Without it, thought can never ripen into truth. Free should the scholar be, — free and brave… Brave; for fear is a thing, which a scholar by his very function puts behind him. Fear always springs from ignorance… The world is his, who can see through its pretension. The characteristic of a genuine heroism is its persistency. The heroic cannot be the common, nor the common the heroic. The boy wishes to learn to skate, to coast, to catch a fish in the brook, to hit a mark with a snowball or a stone; and a boy a little older is just as well pleased to teach him these sciences. Colleges… can only highly serve us, when they aim not to drill, but to create; when they gather from far every ray of various genius to their hospitable halls, and, by the concentrated fires, set the hearts of their youth on flame. Books are the best type of the influence of the past… The theory of books is noble. We are students of words: we are shut up in schools, and colleges, and recitation -rooms, for ten or fifteen years, and come out at last with a bag of wind, a memory of words, and do not know a thing. There is a time in every man’s education when he arrives at the conviction that envy is ignorance; that imitation is suicide; that he must take himself for better for worse as his portion. See in college how we thwart the natural love of learning by leaving the natural method of teaching what each wishes to learn, and insisting that you shall learn what you have no taste or capacity for. The college, which should be a place of delightful labour, is made odious and unhealthy, and the young men are tempted to frivolous amusements to rally their jaded spirits. Scholarship is to be created not by compulsion, but by awakening a pure interest in knowledge. The wise instructor accomplishes this by opening to his pupils precisely the attractions the study has for himself. The marking is a system for schools, not for the college; for boys, not for men; and it is an ungracious work to put on a professor. Genius borrows nobly. When Shakespeare is charged with debts to his authors, Landor replies: “Yet he was more original than his originals. He breathed upon dead bodies and brought them into life”. The intellect is vagabond, and our system of education fosters restlessness. The Gods we worship write their names on our faces; be sure of that. When we have new perception, we shall gladly disburden the memory of its hoarded treasures as old rubbish. What I must do is all that concerns me, not what the people think. This rule, equally arduous in actual and intellectual life, may serve for the whole distinction between greatness and meanness. Stay at home in your mind. Don’t recite other people’s opinions. What am I? And what is? Asks the human spirit with a curiosity new-kindled, but never to be quenched. A painter told me that nobody could draw a tree without in some sort becoming a tree; or draw a child by studying the outlines of its form merely… but by watching for a time his motions and plays, the painter enters into his nature and can then draw him at every attitude. The purpose of life seems to be to acquaint a man with himself and whatever science or art or course of action he engages in reacts upon and illuminates the recesses of his own mind. We will walk on our own feet; we will work with our own hands; we will speak our own minds… A nation of men will for the first time exist, because each believes himself inspired by the Divine Soul which also inspires all men. Thought is all light, and publishes itself to the universe. It will speak, though you were dumb, by its own miraculous organ. It will flow out of your actions, your manners, and your face. It will bring you friendships. It will impledge you to truth by the love and expectation of generous minds. Power ceases in the instant of repose; it resides in the moment of transition from a past to a new state, in the shooting of the gulf, in the darting to an aim. Success treads on every right step. For the instinct is sure, that prompts him to tell his brother what he thinks. He then learns, that in going down into the secrets of his own mind, he has descended into the secrets of all minds. It is easy in the world to live after the world’s opinion; it is easy in solitude to live after our own. The imitator dooms himself to hopeless mediocrity. The inventor did it because it was natural to him, and so in him it has a charm. When you were born you were crying and everyone else was smiling. Live your life so at the end, your’re the one who is smiling and everyone else is crying. The mark of the man of the world is absence of pretension. He does not make a speech; he takes a low business-tone, avoids all brag, is nobody, dresses plainly, promises not at all, performs much, speaks in monosyllables, hugs his fact. I am arrived at last in the presence of a man so real and equal that I may drop even those undermost garments of dissimulation, courtesy, and second thought, which men never put off, and may deal with him with the simplicity and wholeness, with which one chemical atom meets another. The other element of friendship is tenderness. We are holden to men by every sort of tie, by blood, by pride, by fear, by hope, by lucre, by lust, by hate, by admiration, by every circumstance and badge and trifle, but we can scarce believe that so much character can subsist in another as to draw us by love. Can another be so blessed, and we so pure, that we can offer him tenderness? When a man becomes dear to me, I have touched the goal of fortune. Always scorn appearances, and you always may. The highest compact we can make with our fellow is, “Let there be truth between us two forever more”. Friends seem to be only mirrors to draw out and explain to us ourselves; and that which draws us nearer our fellow man, is, that the deep Heart in one, answers the deep Heart in another, — that we find we have (a common Nature) — one life which runs through all individuals, and which is indeed Divine. Our intellectual and active powers increase with our affection. The scholar sits down to write, and all his years of meditation do not furnish him with one good thought or happy expression; but it is necessary to write a letter to a friend, and, forthwith, troops of gentle thoughts invest themselves, on every hand, with chosen words. I must feel pride in my friend’s accomplishments as if they were mine, and a property in his virtues. I feel as warmly when he is praised, as the lover when he hears applause of his engaged maiden. I do not wish to treat friendships daintily, but with roughest courage. When they are real, they are not glass threads or frost-work, but the solidest thing we know. Friendship is for aid and comfort through all the relations and passages of life and death. It is fit for serene days, and graceful gifts, and country rambles, but also for rough roads and hard fare, shipwreck, poverty, and persecution. We are to dignify to each other the daily needs and offices of man’s life, and embellish it by courage, wisdom and unity. It should never fall into something usual and settled, but should be alert and inventive, and add rhyme and reason to what was drudgery. The essence of friendship is entireness, a total magnanimity and trust. Let your greatness educate the crude and cold companion. Conservatism stands on man’s confessed limitations; reform on his indisputable infinitude; conservatism on circumstance; liberalism on power; one goes to make an adroit member of the social frame; the other to postpone all things to the man himself; conservatism is debonnair and social; reform is individual and imperious. Reform is affirmative, conservatism negative; conservatism goes for comfort, reform for truth. Conservatism is more candid to behold another’s worth; reform more disposed to maintain and increase its own. The true test of civilization is, not the census, nor the size of the cities, nor the crops – no, but the kind of man the country turns out. From Washington, proverbially ‘the city of distances,’ through all its cities, states, and territories, it is a country of beginnings, of projects, of designs, and expectations. Those who stay away from the election think that one vote will do no good: ‘Tis but one step more to think one vote will do no harm. Nature is methodical, and doeth her work well. Time is never to be hurried. Grow angry slowly – there’s plenty of time. A moment is a concentrated eternity. What would be the use of immortality to a person who cannot use well a half an hour? Sickness is poor-spirited, and cannot serve anyone; it must husband its resources to live. But health or fullness answers its own ends, and has to spare, runs over, and inundates the neighborhoods and creeks of other men’s necessities. Prudence is the virtue of the senses. […] It is content to seek health of body by complying with physical conditions, and health of mind by the laws of the intellect. I will say, get health. No labor, pains, temperance, poverty, nor exercise, that can gain it, must be grudged. The best part of health is fine disposition. It is more essential than talent, even in the works of talent. We don’t grow old. When we cease to grow, we become old. Travelling is a fool’s paradise. Our first journeys discover to us the indifference of places. At home I dream that at Naples, at Rome, I can be intoxicated with beauty, and lose my sadness. I pack my trunk, embrace my friends, embark on the sea, and at last wake up in Naples, and there beside me is the stern fact, the sad self, unrelenting, identical, that I fled from. I seek the Vatican, and the palaces. I affect to be intoxicated with sights and suggestions, but I am not intoxicated. My giant goes with me wherever I go. I am not much an advocate for traveling, and I observe that men run away to other countries because they are not good in their own, and run back to their own because they pass for nothing in the new places. For the most part, only the light characters travel. For the most part, only the light characters travel. Who are you that have no task to keep you at home? No man should travel until he has learned the language of the country he visits. Otherwise he voluntarily makes himself a great baby – so helpless and so ridiculous. Everything good is on the highway. Our minds travel when our bodies are forced to stay at home. The soul is no traveler; the wise man stays at home, and when his necessities, his duties, on any occasion call him from his house, or into foreign lands, he is at home still. I have no churlish objection to the circumnavigation of the globe, for the purposes of art, of study, and benevolence, so that the man is first domesticated, or does not go abroad with the hope of finding somewhat greater than he knows. He that does not fill a place at home, cannot abroad. He only goes there to hide his insignificance in a larger crowd. You do not think you will find anything there which you have not seen at home? The stuff of all countries is just the same. The phrase ‘to know the world,’ or to travel, is synonymous with all men’s ideas of advantage and superiority. No doubt, to a man of sense, travel offers advantages. The uses of travel are occasional, and short; but the best fruit it finds, when it finds it, is conversation; and this is a main function of life. From evils which never arrived. 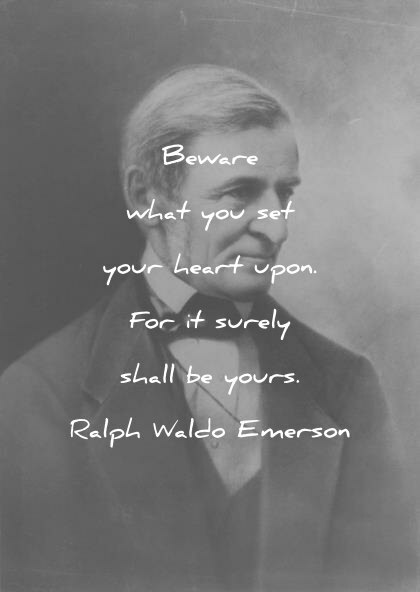 What is your favorite Emerson quote? Would you like to add another one here? Please let me know in the comment section below! 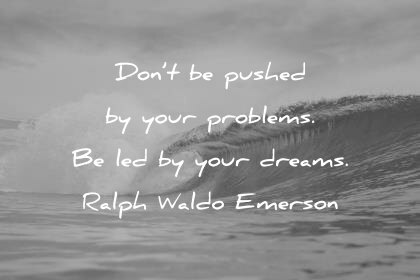 beautiful beauty children courage deep education fake famous fear friendship funny god happiness health inspirational knowledge life love marriage mind nature peace poems quotes ralph waldo emerson short society spirituality success thinking time travel wisdom.